The story begins in 1967 (Burrough’s future) with the endless Great War (World War I) finally ending and the Earth destroying all its weapons in an atempt to return to peace. Admiral Julian 3rd tells the reader his future, how he will be reborn as his grandson Julian 5th in the next century to journey through space and crash-land on the Moon. There Julian finds not the airless rock that we know but a planet like world with plants and creatures. The Moon, Julian discovers, is actually hollow and inside he finds the Moon Maid, Nah-ee-lah. Introduced as an angelic female, Nah-ee-lah’s wings have been ripped from her body and she and Julian are forced through many adventures together and soon fall in love as evil communist like Kalkers take over the Moon. The Kalkers are Burrough’s take on the Bolsheviks. In parallel to Gould’s Moon Maid & Junior, Julian takes Nah-ee-lah back to Earth at the end of the story where the two are married and Julian 6th is born. There the similarities end. The sequel books, The Moon Men, in which Julian 9th refuses to bow down to conquering Kolkar Moon Men and The Red Hawk wherein Julian 20th leads humanity to throw off the yoke of the Kolkar invaders many centuries later do not include the Moon Maid. Chester Gould and Edgar Rice Burrough both wrote in the same era and one might suppose Chester was familiar with the Tarzan author and named his Moon Maid in homage to Burrough’s science fiction story. Then again, it’s possible the maid from the moon term was simply one that resonated with both men. 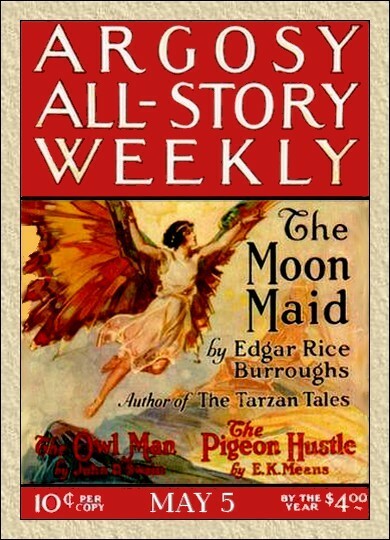 Due to the age of the story and Burrough’s death in 1950, the copyright for Moon Maid has expired in the United States and many other countries. You can read the Moon Maid on the Australian Gutenberg Project website here. There are a number of edited/annotated copies of The Moon Maid on Amazon, which is legal because of the expired copyright. Be careful and read the reviews if you go that route, many are out to make some easy money and are reportedly awful.